I can’t get NY bagels from NY or another place for that matter shipped to AZ for what I can afford. I live too far away from Phoenix valley or Flagstaff to buy them and they don’t ship. SO I searched internet for recipe, eventualy finding you on YouTube then your web page. I love cinnamon raisin bagels. Thanks to your video of how to I might get the courage to bake some. I just wish you had a video of how your eagles looked as you pulled them from the oven, but the 3 video you posted on your site was a huge help. Your girls are real cute. Thank you, Vicki a senior citizen living at White Mountain Lake, near Show Low AZ. Great to meet you, Vicki! I understand the craving for bagels and the difficulty in finding good ones! 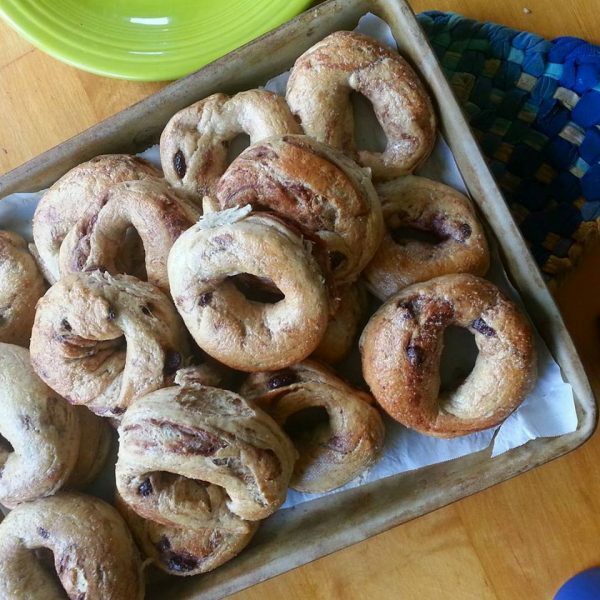 I hope you can try these and get your bagel fix! Yes! we love poppy seed and everything bagels with onion flakes!